Did you know that you get $3.00 off any dry cleaning purchase of over $15 dollars or more? 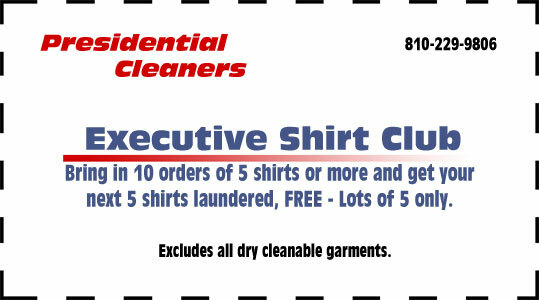 You can also join the Executive Shirt Club by printing off the card below in order to save a bundle on a future cleaning! 100 E. St. Paul St. COPYRIGHT (©) 2015 PRESIDENTIAL DRY CLEANERS. ALL RIGHTS RESERVED.